In Store & Online: Join their list to get Maurices email updates and receive a 15% or 30% coupon valid on all regular priced merchandise. Note: Click on "join our list" on the top left side of their site and fill out the form. In Store: Try on any bottom in stores to get 25% off your total regular price purchase. Offer not valid on clearance merchandise. Online: Click to activate coupon, discount automatically applied at checkout. Save $10 when you spend $60. Get $15 off when you spend $75, or get $25 off when you spend $100 or more! Offer valid online only at maurices.com. Print the whole page or show on mobile phone for a 30% discount on all regular priced merchandise in-store, valid at a Maurices store near you. Present this coupon in-store now through October 23, 2016 to receive $25 off every $100 purchase. Print out the coupon, you will need the code. Valid in store on sweaters, sweatshirts, jeans, tanks, and more. Print coupon and receive a 20% discount on your entire regular-priced purchase in-store or 25% off when you use your Maurices credit card. Print coupon for a $10 discount on every $50 you spend. Valid at your local Maurices store. Get all Maurices coupons here on this page.. Maurices stores specialize in girls clothing, women's clothing, plus size teen and women clothing. 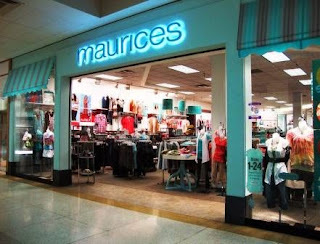 Maurices is a fashion clothing retailer that carries a wide range of designer clothing and special occasion dress collections for women. Visit us to see their latest up to date discounts, promo codes, and printable coupons.